The chaos of this national election has many people wondering if we are seeing the death of the Republican Party. That may be possible, but political parties reinvent themselves periodically. What we may be witnessing, however, is the death spiral of the Fourth Estate, the mainstream media. According to a recent Gallup poll, trust in mainstream media is at an all-time low. Only 51 percent of Democrats, 30 percent of independents, and 14 percent of Republicans trust mainstream media. Thirty-seven percent of people over age 50—and only 26 percent of 18-49 year olds—trust mainstream media. That may explain why the evening news has turned into infotainment for seniors, sponsored by products for erectile dysfunction and bladder control. To be sure, the First Amendment is alive and well in America. There is no shortage of political speech throughout the entire range of political thought, but people are turning to more fragmented, targeted, and partisan news sources. This may be in part because of such innovations as smart phones and social media. This also may be in part because mainstream media has become so big and self-enthralled that they are out of touch with average Americans. There was a day when newsmen like Walter Cronkite reported news in a tough, straightforward, and non-partisan manner. They represented America because they were wholly part of America. They grew up humbly, survived the Great Depression and World War II, and came home, like millions of others. Many of today’s national journalists are people of privilege—denizens of Manhattan and Georgetown—with pedigrees from elite journalism schools. Rather than reporting the news and trusting people to form their own opinions, too many of today’s journalists have taken it upon themselves to tell people what to think. 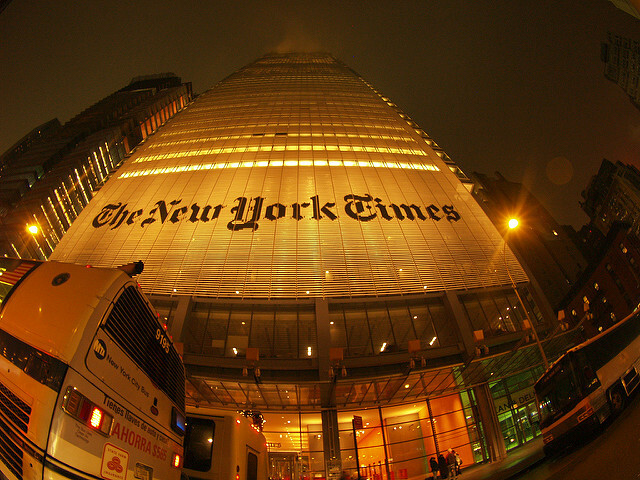 On Aug. 7, 2016, New York Times media columnist, Jim Rutenberg, noted that, “Balance has been on vacation since Mr. Trump stepped onto his golden Trump Tower escalator last year to announce his candidacy.” He noted too that right after the convention, the entire media establishment turned against Trump—a turn he fully endorsed. Last March, Les Moonves, the chief executive officer of CBS, said, “Donald Trump is terrible for America, but he is great for our bottom line. Keep it up Donald!” The $2 billion in free media given to Donald Trump effectively drowned out really good candidates. Now, the media that propped up Trump is trying to tear him down, and overplaying their hand—a fact not lost on most Americans. The Hill recently reported analysis that showed that of 66 minutes of total airtime on ABC, CBS, and NBC news programs, the big three gave 23 minutes of coverage to accusations of unwanted sexual contact by Donald Trump, while they gave disturbing WikiLeaks about Hillary Clinton and her campaign—which show real abuses in governance—a scant 57 seconds of airtime. Good-government types say there is too much money in politics, but they count only money raised and spent by campaigns and such outside entities as unions, interest groups, and SuperPacs. They don’t tally the coverage of campaigns by for-profit media corporations. If one scored the messaging done by major print and broadcast media, the total value would eclipse anything raised and spent by candidates. So, as politicians clamor to overturn the Citizens United decision that lets other corporations and media participate in politics, given its track record, should legacy media be given a monopoly on political speech? Also, as Baby Boomers pass on and the 18-49 year olds mature and take their place, will the trend away from traditional national media, and toward such focused media, as MarylandReporter.com, and local print and broadcast media become more important? During the Vietnam War, President Lyndon Johnson reportedly said, “If I’ve lost Cronkite, I’ve lost Middle America.” Neither President Obama nor any presidential candidate can say anything similar because mainstream media no longer reflects Middle America. Through its efforts to influence the national election, we may be witnessing the Fourth Estate’s last gasps for relevance. I hope not. But if we are, then mainstream media only has itself to blame. Michael Collins can be reached at michael.collins.capital@gmail.com. In his 97 years, Ralph Hostetter, in pursuit of his many interests, personal and business, touched many lives for the good. He was my friend and the editorial support of his newspapers contributed greatly to my political success.